Greenport is basically a greener version of China Glaze For Audrey. : ) The two colours are very similar indeed, maybe I should take a comparison picture of the two. : ) The formula on this one is perfect and it applied like a dream. I like that color very much. I don't own many Essies (yet! >.<) this is def on my list! this is a pretty color! 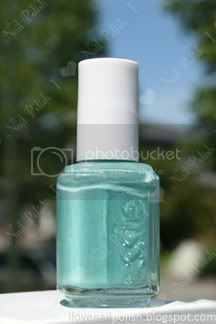 do you know where I can purchase Essie? and may I ask how Essie polishes are compared to OPI and china glaze? thank you very much! This is such a beautiful color. Looks very pretty on you. I own all three and have worn this one. It looked so pretty on me. I couldn't get over how lovely it was. I kept looking at it all day. Good thing I wasn't driving! Wow! What a fabulous color!